National Museums Scotland has just acquired a remarkable group of East Asian works of art, donated by David and Anne Hyatt King via the Art Fund. 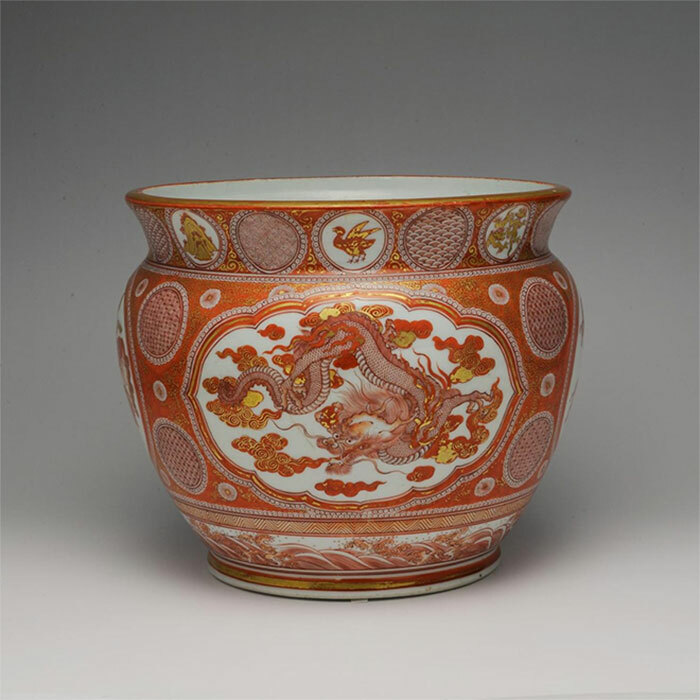 The group comprises 342 Japanese ceramics, 7 Japanese paintings, and 74 Chinese ceramics. Works made by the lineages of named potters from the mid-19th through to the late 20th century, and especially the lineage of Seifū Yohei. Globular yellow vase by Seifu Yohei III, 1890s, made in the Imperial Chinese style. 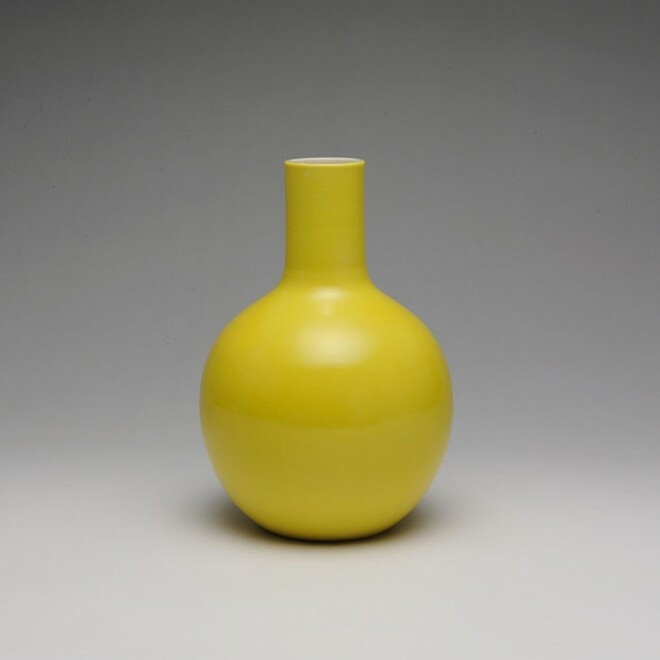 See this vase in Masters of Japanese Porcelain at the National Museum of Scotland. Further, many of the works illustrate the strong influence of Chinese ceramics in Japan, and in this connection Mr and Mrs King have acquired a significant number of Chinese pieces. Kutani red planter decorated with many Chinese themes, made in Japan between 1890 and 1910. Mr King was a major lender to the exhibition The Lost Century: Japanese Arita Porcelain 1720-1820 in Britain, which was shown at the National Museum of Scotland in 1998. This was an area of particular interest to him, as this period has been sorely neglected by ceramic historians. Mr King has always been keen to ensure that the quality of these pieces can be appreciated by the general public, and has therefore been placing works on loan to various public collections in the UK for many years. Mr and Mrs King expressed a wish to extend this generosity in the form of a donation, and as a result, over the past three years I have been working with them to decide a selection of works to be given to National Museums Scotland. They generously invited me into their home to view the ceramics, and we enjoyed many hours unpacking and viewing works, many of which are stored in their original wooden presentation boxes signed by the artists themselves. The visits were followed by a long-distance discussion of various pieces and then repeated exchanges of lists and revisions of lists! Once the selection had been agreed, the ceramics were transported to Edinburgh, where the task began of checking and numbering them all. They are now available to scholars and researchers investigating any of the multiple areas represented in the collection, and a changing selection of the works will be included in the Museum’s new East Asia gallery, scheduled to open in 2018. More immediately, a display at the front of the Grand Gallery celebrates the gift and presents a small selection of works. Choosing which pieces to include from over 400 was no simple task! 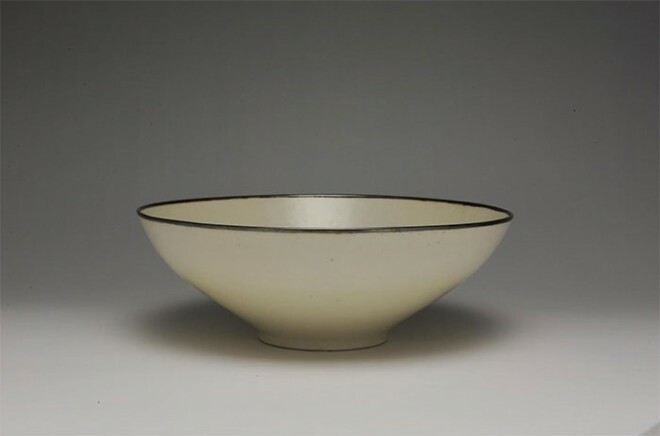 There are so many different stories that can be told from the collection, but in the end I chose to focus on works made by the four potters who were awarded the prestigious accolade of Imperial Household Artist. This was a system instituted by the Japanese government in 1890 to recognize and support artists who had achieved a level of success and renown within their respective crafts. The first ceramic artist to be appointed, in 1893, was Seifū Yohei III (1851–1914). He was joined three years later by Miyagawa Kōzan (1842–1916). In 1917, after the death of these two masters, Itō Tōzan I (1846–1920) and Suwa Sozan I (1851–1922) were appointed. These four men had all achieved success at the frequent competitive art exhibitions. Their most prestigious creations were grand and impressive presentation pieces for the court, but they were also capable of small-scale works for private enjoyment. They all strove to improve their art through tireless experimentation, and their works are characterised in both shape and decoration by a refined subtlety, making for pieces of great visual appeal. 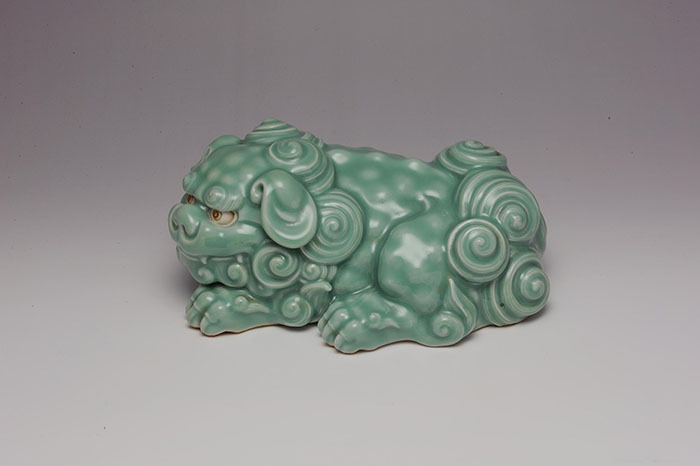 Mythological lion-dog by Miyagawa Kozan I, on display in Masters of Japanese Porcelain at the National Museum of Scotland. Bowl by Ito Tozan I, with a design of a dragon and phoenix, 1920. See this bowl in Masters of Japanese Porcelain at the National Museum of Scotland. Conical bowl with a metal rim, decorated with fishes, by Suwa Sozan I, made 1917 – 1922. 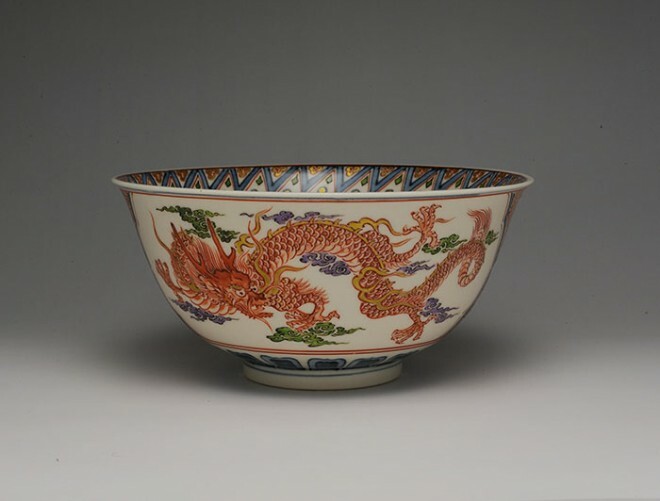 This bowl is on display in Masters of Japanese Porcelain at the National Museum of Scotland. In addition to the ceramics, Mr and Mrs King have donated a number of small-scale paintings from the 19th century, in the handscroll and album formats, depicting landscapes and plants. As with many of the ceramics, these were done by painters very much influenced by Chinese painting modes of the time. There is also a spectacular folding screen by the artist Sugai Baikan (1784–1844), with an ink painting of plum blossom. Plum Tree, by Sugai Baikan, first half 19th century. National Museums Scotland is privileged to receive this very generous gift from Mr and Mrs King via the Art Fund, which strengthens the Japanese and Chinese ceramics collections immeasurably. Edinburgh will now be an essential destination for anyone wanting to appreciate and understand the rich traditions of East Asian ceramics. Masters of Japanese Porcelain runs at the National Museum of Scotland from 6 March – 30 August 2015. You can see more items presented by David and Anne Hyatt King through the Art Fund here. An amazing exhibition of beautiful Japanese porcelain. All those who are touched by beauty should see this. Congratulations NMS- this collection is a coup – I hope you realise how lucky you are to have it because no one else in Western museums has anything like it!! It will be great reference point for all of us for posterity.